When Soviet Ground Forces commander Marshal Valeriy Chuykov found out that the British were going to install the 105mm L7 gun in an improved variant of the Centurion tank, and the Americans and Germans planned to use the same gun in their new medium tanks, he really did go ballistic. Demanding that the Soviets had to have a bigger tank in the field even if “you have to strap it on the back of a pig” his demand to the military industrial complex set in motion one of the great parings of the cold war – what emerged as the Soviet T-62 in the hands of its client states versus the US and its allies armed with the M60 main battle tank. Neither one was a very original design – both evolved from proven designs. The T-62 was a modified T-55 tank that was reworked to fit the big 115mm U-5TS gun onto a medium tank chassis; the M60 combined the best ideas of the day with design improvements to the M48A2 medium tank to come up with a diesel powered and 105mm armed tank. Ditto the M60. The future US tank program at the time was the T95 with a totally new chassis, new turret, new gun and new features all around. But with the failure of the T95 program a new design had to be created in a hurry. Design features like the new glacis design, the 105mm M68 (license built L7) and a big AVDS-1790 series diesel engine were used to create the new interim tank that became the M60. Both tanks evolved as well. By 1965 the M60 had received a new turret with a thinner front profile and wide bustle to become the M60A1; in 1972 the T-62 gave up the pretense of being a “tank destroyer” and added a 12.7mm AA machine gun. Incidentally both tanks had an outlier tank destroyer variant armed with missiles: the IT-1 with the “Drakon” missile and the M60A2 “Starship” with the Shillelagh. Neither one was very popular and both were only seen as short term solutions. However, the IDF did note that whereas 2/3rds of Centurions knocked out were returned to service only 20% of the M48 and M60 series tanks were as fortunate. 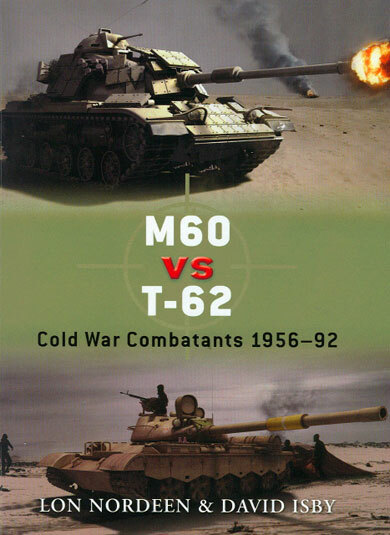 The last gasp to date between the T-62 and the M60 took place during Operation Desert Storm in 1991. Here USMC M60A1 RISE tanks with explosive reactive armor fitted to them clashed with tanks from the Iraqi 5th Mechanized Division and 3rd Armored Division during the ground war. The results were not close, but both sides basically admitted it was due to the poor training levels of the Iraqi crews more than a failing of their equipment to stand up. While Iraqi fairy tales abound (one of the best involves a company of T-62s from the 16th Infantry Division that lulled a company of M1A1 tanks into point blank range, destroyed five and damaged nine while escaping with no losses) the actual results were that their forces were ineffectual. The book covers these two episodes in great detail and does note where claims are not substantiated. There are a number of good photos and color drawings to illustrate the authors’ text. Both Lon and David are excellent authors and historians, and the book is a good read on these Cold Warriors and their fates. Thanks to David Isby for the review copy.